Sergliflozin etabonate is a SGLT-2 inhibitor potentially for the treatment of type 2 diabetes and obesity. Canagliflozin hydrate is a glucoside-derived SODIUM-GLUCOSE TRANSPORTER 2 inhibitor that stimulates urinary excretion of glucose by suppressing renal glucose reabsorption. Remogliflozin Etabonate is an orally available prodrug of remogliflozin, a benzylpyrazole glucoside-based inhibitor of renal sodium-glucose co-transporter subtype 2 (SGLT2) with antihyperglycemic activity. Phlorizin is a non-selective SGLT inhibitor with Kis of 300 and 39 nM for hSGLT1 and hSGLT2, respectively. Phlorizin is also a Na+/K+-ATPase inhibitor. 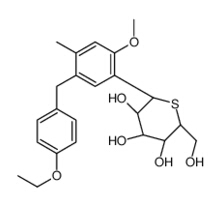 Luseogliflozin, also known as TS-71 and TS-071, is a potent and competitive inhibitor of sodium-dependent glucose cotransporter 2 (SGLT2 inhibitor). Ipragliflozin is a Sodium/glucose cotransporter 2 (SGLT2) inhibitor (gliflozin). Ipragliflozin (ASP1941) is a highly potent and selective SGLT2 inhibitor with IC50 of 2.8 nM; little and NO potency for SGLT1/3/4/5/6. PF-04971729, a potent and selective inhibitor.PF-04971729(Ertugliflozin) is a potent and selective inhibitor of the sodium-dependent glucose cotransporter 2(SGLT2). PF-04971729(Ertugliflozin) is a potent and selective inhibitor of the sodium-dependent glucose cotransporter 2(SGLT2). 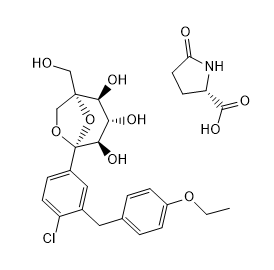 Tofogliflozin(CSG-452) hydrate is a potent and highly specific sodium/glucose cotransporter 2(SGLT2) inhibitor with Ki values of 2.9, 14.9, and 6.4 nM for human, rat, and mouse SGLT2.